28th SEA Games Singapore 2015 has officially started via a magnificent Opening Ceremony welcoming over 7,000 athletes from 11 participating nations, including the Philippines. The SEA Games 2015 Opening Ceremony was held earlier this evening, June 5, 2015, at the new National Stadium in Singapore. 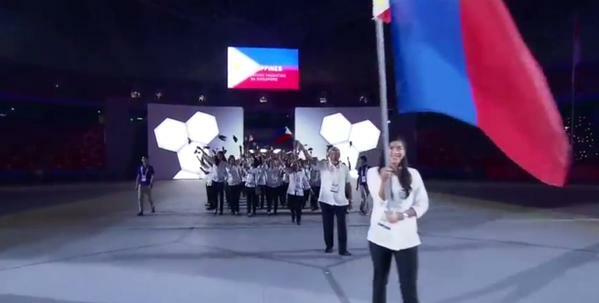 The Philippine contingent was led by volleyball player Alyssa Valdez as our Philippine flag bearer. Valdez is part of our volleyball team competing in this year's SEA Games. It was one proud moment for us Filipinos to see Alyssa and the rest in the official SEA Games 2015 live stream as they made their entrance there, representing our beloved country. But I couldn't stop laughing when I heard Alyssa being wrongly introduced by the commentator or announcer as "Alicia Valdez", which immediately made it as among the trending topics on Twitter, and not the correct one (Alyssa Valdez). The Philippines has sent 472 athletes in the 2015 SEA Games. (View: SEA Games 2015 Schedule for Team Philippines) Some of them already competed ahead of the opening ceremony. As of today, the Philippine delegation already has 3 silver medals and a bronze, ranking 5th so far among the 11 participating countries.